Salthouse Lane, running between Huish and West Hendford, was shown on Watts' maps of 1806, 1831 and 1842 although he confused the name Salt-House Lane with Horsey's Lane in both 1806 and 1842. On the maps of both these years the lane was shown with no buildings whatsoever, although the salt-house and the tan yard were shown on the 1831 map. The lane was the line of the 1830 borough boundary extension and is shown on Watts' map of 1831 with a field called Croft to its west and a field called Waterloo Gardens to the east. There was a long building at the northern end of the lane in Waterloo Gardens that appears to be the actual salt-house (in the days before refrigerators meat was steeped in large vats of brine, or salt water, to preserve it). However in Hickes & Isaac's map of 1858 the southern half of this long building was, in fact, shown as four cottages in addition to the salt-house. 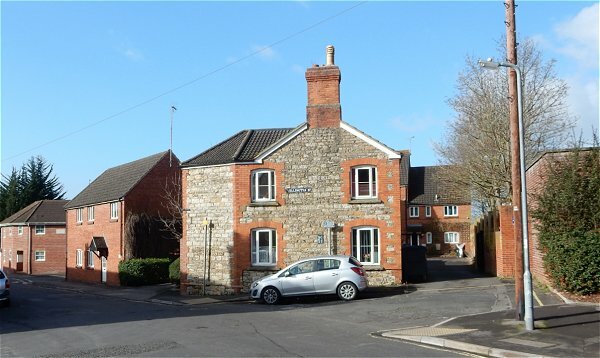 The cottages were known as Spring Gardens, at least by 1886 when the Ordnance Survey map shows the cottages and the salt-house building all labelled as Spring Gardens. It seems, therefore, most likely that the salt-house and the cottages were built more or less at the same time, and in any event by 1831. 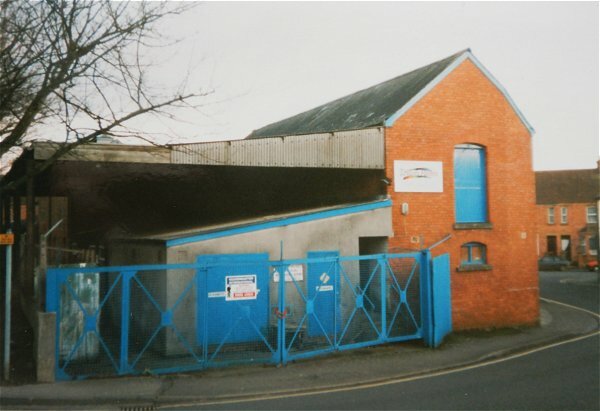 At the southern end of Salthouse Lane was a tan yard owned by John Perrott and facing today's West Hendford. Perrott was in dispute with the Town Commissioners and threatened to 'indict' the road unless they would put it into good repair. The Yeovil Poll Book of 1733 lists Joseph Jeans as a "Salter of Yeovill". Bidder's map of 1843 shows Croft divided into two fields but Waterloo Gardens had Wellington Street constructed along its western side with a few houses built either side. Consequently that part of Waterloo Gardens between Salthouse Lane and the buildings of Wellington Street had been divided up into separate plots. 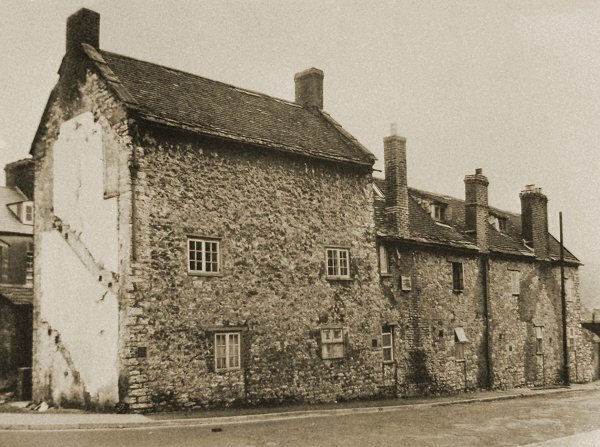 The buildings in Salthouse Lane remained as in 1831. It may be that an early name for Salthouse Lane was Wilmington's Lane, as listed in the 1841 census, or just Wilmington Lane in the 1851 census. 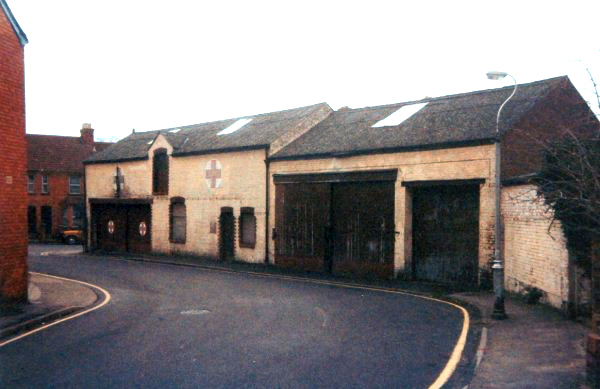 By the time of the 1886 Ordnance Survey it would appear that the salt-house had been included with the adjacent small terrace of housing called Spring Gardens and the tan yard at the southern end was now extended as the candle factory and on the outside corner of the bend the buildings had been constructed that were later to become the ambulance station. 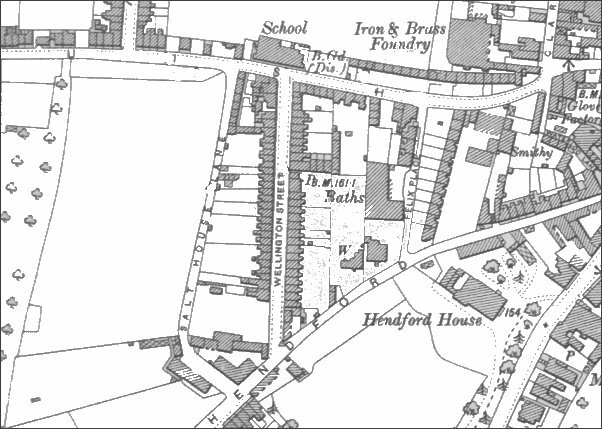 The 1886 Ordnance Survey, shows the salt-house (as two unequal parts on the corner with Huish) and the cottages all labelled as Spring Gardens. Whether or not the salt-house was converted to residential property is not known. The corner-most section of the salt-house would be demolished at some time after the 1901 map below but before the photograph in the Gallery. Both the former salt-house and the cottages were still being shown on the Ordnance Survey map as late as 1938 (although it was based on a survey undertaken in 1885 and revised in 1901). No further developments are discernible on the 1901 or 1912 Ordnance Surveys other than the future ambulance station being slightly enlarged. Ultimately Huish County Junior School would be built on the north-west corner of Salthouse Lane at some time before 1927 but the rest of the land to the west of Salthouse Lane, originally the field called Croft, was to remain as an open space called the Fairfield until the 1970s, when the Wellington Flats development was constructed. 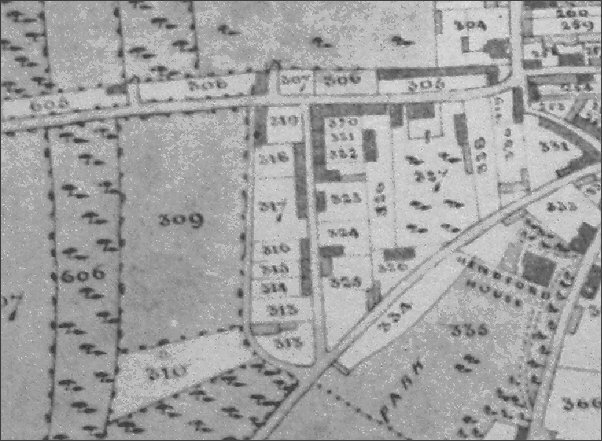 Bidder's map of 1843 shows Salthouse Lane left of centre, with fields numbered 309 and 310 (formerly the field called Croft) to its west and the various plots of Wellington Street to its east. Huish runs along the top of the map and West Hendford runs from right centre to bottom centre. At the top of Salthouse Lane in the plot marked 219 is the salt-house, while at the bottom in the plot marked 313 is the tan yard. 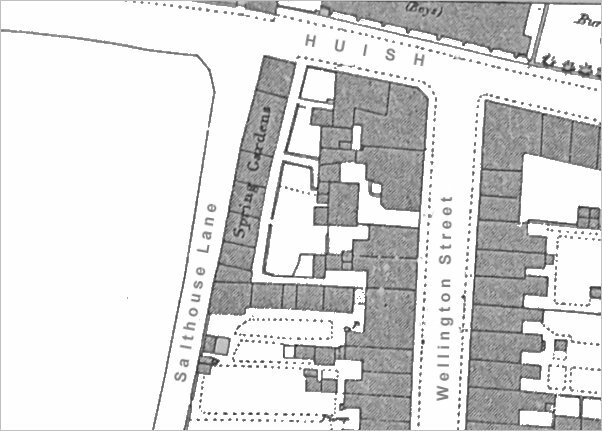 This map, based on the 1901 Ordnance Survey, shows Salthouse Lane still completely undeveloped to the west and much to the east remained as the gardens of Wellington Street houses. 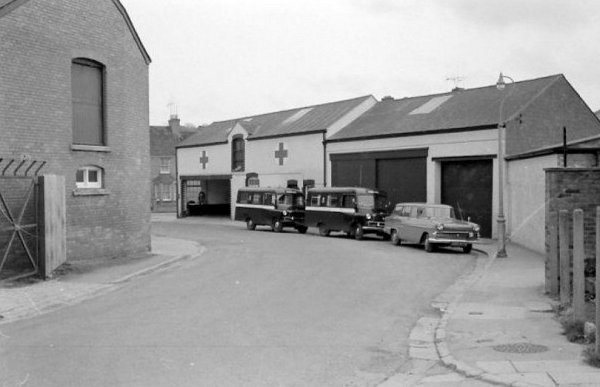 At the southern end the candle factory had come into existence by the 1880s and the buildings on the outer bend of Salthouse Lane, later to become the ambulance station, had been constructed by the same time. The salt-house, at left, from where the name Salthouse Lane derives with the cottages of Spring Gardens at right. 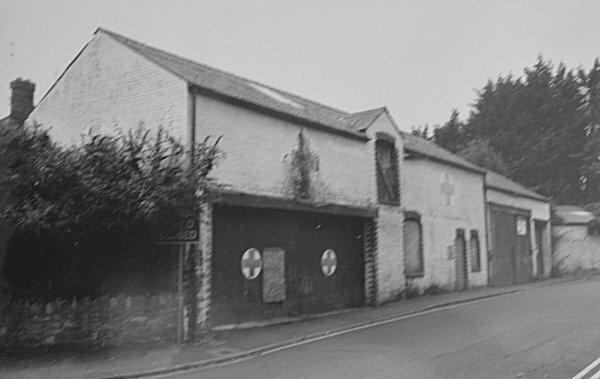 Photographed after 1886 (after the corner section seen in the 1886 map above had been demolished) and seen from Huish with Salthouse Lane running off to the right. 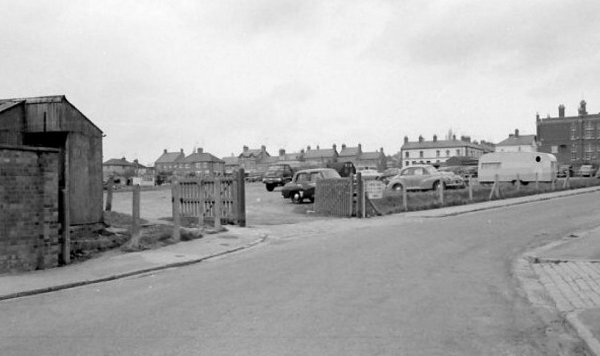 This photograph, taken in the 1960s, is at the southern end of Salthouse Lane looking towards West Hendford, indeed a house in West Hendford is glimpsed between the candle factory building at left and the ambulance station at centre. I believe, although I'm not certain, that this was a St John's ambulance station. I can remember walking past it every day when I lived in West Hendford during the late 1970's but clearly didn't take a lot of notice then. .... and photographed in 1983. Courtesy of John Cornelius. This photograph features in my book "Now That's What I Call Yeovil"
.... and seen from West Hendford. .... and seen in black and white.. This photograph, looking across Fairfield, was probably taken at the same time as the previous, but the photographer has turned through 180° and looks across the fair field towards Huish. Salthouse Lane runs off to the right. Courtesy of Vivien and John Cornelius. 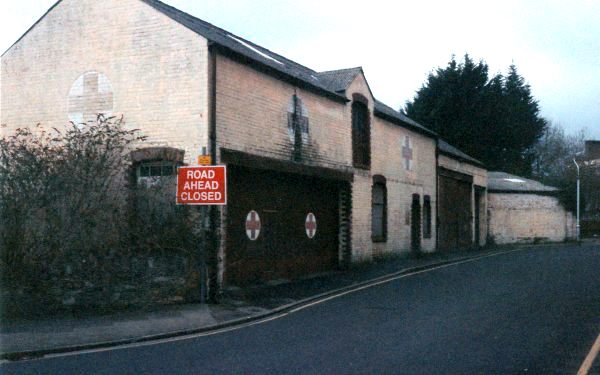 On the opposite side of Salthouse Lane, facing the ambulance station, was the old candle factory which, at the time of this photograph in 1998, was occupied by Taylor's Paints. 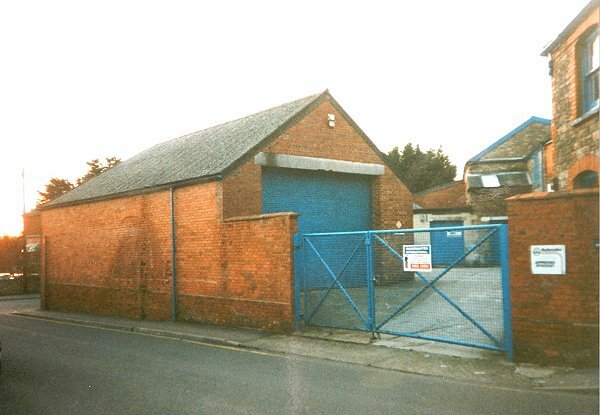 Again photographed in 1998, the West Hendford frontage of Taylor's Paints. The last remaining building from the original Wellington Street. 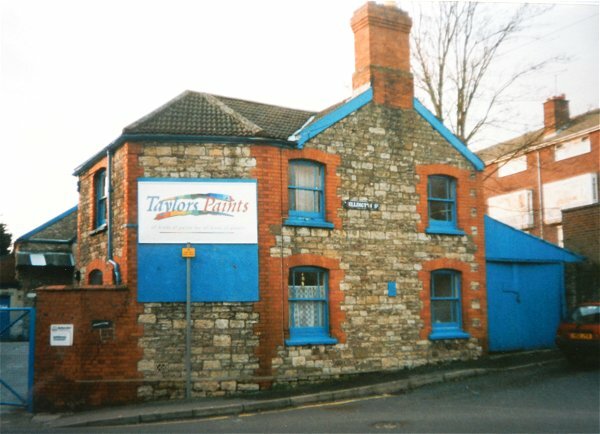 Photographed in 1998 at which time it was the premises of Taylor's Paints, who had taken over what had originally been the old candle factory at the junction of Salthouse Lane and Wellington Street with West Hendford. .... and photographed from West Hendford in 2015. 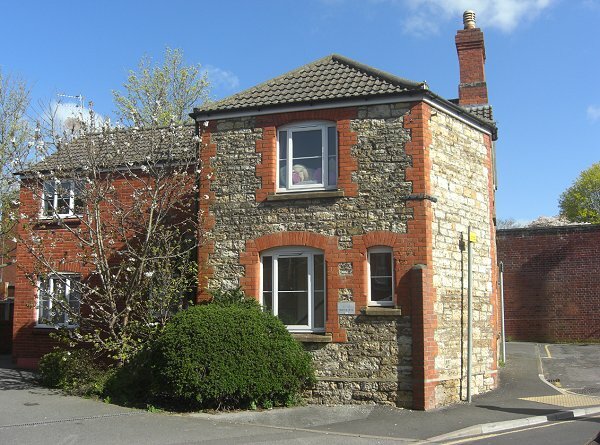 The same building photographed from West Hendford in 2014.